Lakes, mountains, and beaches - Southern California campgrounds offer a spectacular array of camping choices to match everyone's interests. Choose a region to narrow your choices and we'll guide you to the best Southern California campgrounds. Discover the adventures that await you. Note: To enhance continuity between maps, we have included some overlap with our central California map. Outstanding lakeside destinations for family vacations. Beautiful mountain lakes surrounding by forests, expanses of water for boating, waterskiing, and fishing. Hiking trails and horseback riding nearby. Bass Lake - Wonderful Sierra lake with marinas, boating, waterskiing, fishing, and plenty of other activities for all ages. Huntington Lake - High Sierra camping around a great fishing lake. Marinas, boat rentals, nearby hiking and horseback riding. Campsites right on the lake's shore. Lake Thomas A. Edison - Deep in the Sierra Nevada, a beautiful lake. Camp close to the shore and enjoy quiet days of fishing and hiking away from the crowds. Pine Flat Lake - Low elevation lake accessible year-round, great fishing, boating, and camping. Rock Creek - At beautiful Rock Creek Lake and all along the valley, campers will find great destinations for hiking and fishing. Lake Sabrina - Camp near the lake or anywhere along Bishop Creek. Fishing is excellent and nearby hiking trails are magnificent. South Lake - Like its sister lakes, South Lake offers wonderful fishing, camping, and hiking. Come in fall for the dazzling autumn colors. Big Pine Creek - Campsites along the creek are close to wonderful fishing. Hikers head up to the scenic Big Pine Lakes while climbers head for the high peaks. Campgrounds in the southern half of Inyo County serve as gateways to High Sierra trails as well as great places to view the Eastern Sierra's streams, lakes, and jagged summits. Onion Valley - Onion Valley campgrounds are close to a popular trail over Kearsarge Pass, leading into the heart of Kings Canyon National Park. Whitney Portal - Many who camp near Whitney Portal intend to hike to the summit of California's highest peak; others come for the breath-taking scenery. Cottonwood Lakes - Off the beaten path, Cottonwood Lakes and Horseshoe Meadow offer an excellent place to enjoy alpine scenery and hike among crystal lakes. Backpackers use the campgrounds as a jumping-off spot for hikes north into Sequoia National Park. Kennedy Meadows Campground is a key stop for hikers on the Pacific Crest Trail. Sequoia and Kings Canyon National Parks have among the best camping destinations in the High Sierra. Grant Grove - Choose from among 3 wonderful campgrounds and take advantage of ranger-led hikes and campfire programs, tour groves of Giant Sequoias, and linger in the village and Visitor Center. Hume Lake - In Sequoia National Forest, beautiful Hume Lake has non-motorized boating, swimming, and fishing. Drive to nearby Boyden Cave. Sequoia - Camp right at Lodgepole or nearby on Dorst Creek. Climb the trail to the summit of Moro Rock, tour Crystal Cave, and stand in front of the largest tree in the parks, the General Sherman. Mineral King - Fill your gas tank and head out the long, winding road to Mineral King. Camp away from the crowds and soak in the wonderful mountain scenery. Sequoia National Forest features a string of campgrounds from the shores of Lake Isabella, up the banks of the Kern River, across to the high plateau, and northward to remote groves of Giant Sequoias. Lake Isabella - Lake Isabella is a popular recreation area with those who enjoy fishing, boating, and waterskiing. Kern River - Choose a campground along the Kern River for great fishing, whitewater rafting and kayaking, or just relaxing. High Plateau - The remote high plateau county attracts a variety of campers from OHV enthusiasts who find a seemingly endless supply of routes to horseback riders and anglers. Mountain Home Demonstration State Forest contains some of the largest Giant Sequoias in the world as well as a collection of quiet, little campgrounds overlooked by many. Year-round camping opportunities can be found in the low foothills of the southern San Joaquin Valley. To the south in Kern County is their magnificent Buena Vista Aquatric Recreation Area. Buena Vista - Buena Vista Campground is spread beside a wonderful waterskiing, boating, and fishing lake. Comfortable campsites make it a popular family destination. Tule Campground - Success Lake camping offers great campsites with hot showers and other nice amenities. Some campsites have electric hook-ups. Horse Creek Campground - Camp at Lake Kaweah for boating and waterskiing. Only a few miles away is the entrance to Sequoia National Park. Furnace Creek Campground at the heart of Death Valley. Many of the main attractions in Death Valley are within easy driving distance of the campground. Desert camping is a whole new experience for those accustomed to Yosemite National Park or San Clemente Beach. Calico Ghost Town - Calico Ghost Town is hardly rugged desert camping. Enjoy tours and adventures at this authentic 19th-century silver mining town. Relax at the end of the day in your campsite equipped with full hook-ups. Afton Canyon - Experience real desert camping at Afton Canyon, known as the miniature Grand Canyon. Camping is primitive, but the desert has its own special charm. Hole-in-the-Wall Campground - Discover the desert's beauty with mesas, sculpted volcanic walls, sand dunes, and wildflowers. Big Bear Lake is one of the most popular mountain destinations in Southern California, with great camping and recreation. Serrano Campground - The only campground right on the shore of Big Bear Lake is Serrano. Campers there are close to the Discovery Center and to marinas and other attractions. Group Campgrounds - Groups headed for Big Bear have plenty of sites from which to choose, some close to the lake, others tucked back in the forest. Green Spot Equestrian Group Camp - Although it has no potable water, the campground is close to many fine riding trails and can accommodate groups up to 25. 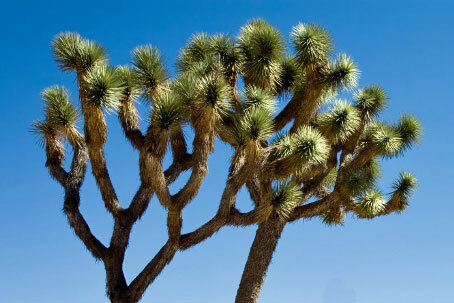 The amazing scenery of Joshua Tree National Park attracts visitors from far and wide. Most campers avoid the high temperatures of summer. Black Rock Campground - Camp near some of the best groves of Joshua Trees, visit the Black Rock Nature Center and Joshua Tree Visitor Center. Indian Cove - Marvel at the amazing rocks, sculpted over the centuries by wind and rain. Tour the Oasis Visitor Center and enjoy interpretive programs. Jumbo Rocks - Camp among massive boulders. Explore places such as Skull Rock, Arch Rock, and the Chollas Cactus Garden. Along the Santa Cruz and Monterey county coasts are a string of nice beach campgrounds as well as a couple popular inland destinations. Santa Cruz Area Beaches - Enjoy New Brighton's popular bluff-top sites or Seacliff's beach-front RV campsites. Big Sur - South of Monterey the Big Sur coast's rugged shoreline is famous around the world. Settle into comfortable sites at Pfeiffer Big Sur State Park's inland campground or head farther south to less-often-frequented Limekiln and Kirk Creek campgrounds. Pinnacles National Park - Explore caves, hike among massive rocks, watch rock climbers scale vertical walls, and keep your eyes open for giant condors. A variety of wonderful campgrounds spread along the central coast from in San Luis Obispo County and inland to several popular recreation lakes. Hearst San Simeon State Park - Campgrounds at the state park make a wonderful place from which to visit Hearst Castle, watch elephant seals at Piedras Blancas, and take in the ambiance of Cambria. Morro Bay - Campers at Moro Bay State Park can paddle around the bay in kayaks, bask in the sun on nearby beaches, and explore Montaña de Oro State Park. Pismo Beach - Camp at Pismo State Beach and roll your 4-wheeler out at Oceano Dunes, or wend your way north to beautiful Avila Beach. San Antonio and Nacimiento Lakes - Camp on the shore of a great fishing and waterskiing lake. Coastal areas of Santa Barbara and Ventura counties are known for wonderful beach camping as well as some great lakes. Carpinteria Beach - Ever popular Carpinteria Beach has a string of great ocean-side campsites for both tents and RVs, excellent facilities, and a variety of attractions. El Capitan State Beach - Campsites among the trees on bluffs overlooking a beautiful stretch of ocean. Cachuma Lake - Only a short drive from Santa Barbara, Cachuma Lake is known as a fishing paradise. Campers enjoy a swimming pool, playgrounds, fireside theater, marina, golf, and more. Lake Casitas - With more than 400 campsites along its shore, Lake Casitas is one of the most popular recreation destinations in Ventura County. A water park, fishing, disc golf, and cycling are only a few of its attractions. With the Angeles National Forest and a number of great lakes, residents of the greater LA area have a wide range of camping choices close at hand. Silverwood Lake - Camp on the shore of one of the area's most popular lakes. Fish, jet ski, waterski, relax, and enjoy the warm sunshine. Angeles National Forest - Drive up the Angeles Crest Highway for wonderful views of the area and a variety of campgrounds. Hike, mountain bike, sit by the campfire, and gaze at the stars. Castaic Lake - Camp beside the Lagoon where you can fish, swim, and paddle your kayak. Or take your boat up to the main lake for waterskiing and wakeboarding. Lake Piru - Find nice campsites at Lake Piru in the shade of olive trees. Enjoy boating, waterskiing, fishing, and now even jet skis. Malibu Creek State Park - Tucked away among the trees north of Malibu is a pretty little state park with hiking trails and a pleasant campground. Close enough to drive to the beach for the day. From Malibu to San Diego, Southern California beach campgrounds are among the most popular in the state. Leo Carrillo State Park - Great amenities at the campground with a short stroll to scenic beaches. Close to popular Zuma Beach. Crystal Cove - Enjoy full hook-ups for your RV, tour historic beach cottages, tide pools, and the Outdoor Nature Center. Swim, surf, and relax on the sand. San Clemente - Camp near Calafia Beach and stroll miles of warm sand. Fish from the pier or try a little surfing at popular spots. San Onofre - Great year-round camping at San Mateo Campground, popular surfing spots, nature trail. South Carlsbad - Wide, sandy beach near well-known surfing destinations. Full hook-ups now available. Rent bicycles and cruise the Carlsbad Seawall Promenade. A number of wonderful country regional parks highlight the camping opportunities in Orange County and in western Riverside County. With easy access from urban areas, the campgrounds make great weekend retreats. Ronald W. Caspers Wilderness Park - Located only a short drive east from San Juan Capistrano, Caspers Wilderness Park offers RV and tent camping along with group and equestrian campsites. Rancho Jurupa Park - Enjoy nice campsites hardly a mile from Riverside. Lake Perris - Bring your boat and enjoy days on the water. RV sites have partial hook-ups. Slip away into the San Bernardino National Forest south of Big Bear Lake and find a wonderul array of campgrounds near Jenks Lake. The campgrounds are only about a half hour drive from Big Bear. Barton Flats Campground - Hike and fish along the Santa Ana River or spend the day and Jenks Lake. Relax in camp with great amenities like restrooms with flush toilets and hot showers. Heart Bar Campgrounds - Set out on hiking and horseback riding trails into the San Gorgonio Wilderness. South Fork Campground - Camp next to the Santa Ana River and hike on the Santa Ana River Trail. Attend campfire programs at Grayback Amphitheater. Soaring peaks and secluded valleys make the San Jacinto Mountains a wonderful camping destination. Mount San Jacinto State Park - Camp at Idyllwild Campground and enjoy great amenities. Hike the nature trail, tour the visitor center, and spend time in the Idyllwild Nature Center. San Bernardino National Forest - Adventurous campers find some great campsites which can serve as bases for launching hikes into the wilderness. Discover the Panorama Point Trail or spend the day at Lake Fulmore. Riverside County Parks - Several county parks in the area offer comfortable camping and access to all the recreation in the area. Try camping at Idyllwild, Hurkey Creek, and McCall Equestrian county parks. Camping in the shadow of famous Palomar Mountain is a unique experience. Many area campgrounds have star gazing programs. Palomar Mountain State Park - Palomar Mountain State Park is at 5,000 feet, several miles west of the observatory. Hike the Doane Valley Nature Trail and fish in Doane Pond. Observatory Campground - Only 2½ miles from the observatory. Participate in the Explore the Stars - Sky Parties offered from spring through fall. Dripping Springs Campground - Gateway to the Agua Tibia Wilderness, a favorite staging area for equestrians. The vast Anza-Borrego Desert State Park has a beauty all its own from jagged peaks to secluded canyons. Nearby are even more campgrounds in state parks, county parks, and the Cleveland National Forest. Anza-Borrego Desert State Park - Camp at Borrego Palm Canyon and enjoy interpretive trails, panoramic overlooks, and native fan palms. Agua Caliente Regional Park - Enjoy geothermally heated springs, camping with full hook-ups, desert hiking, and perhaps a sighting of Bighorn Sheep. William Heise County Park Tent and RV camping with great amenities from showers and electric hook-ups to a full activity program offered by San Diego County Parks and Recreation. This map is for illustrative purposes only. 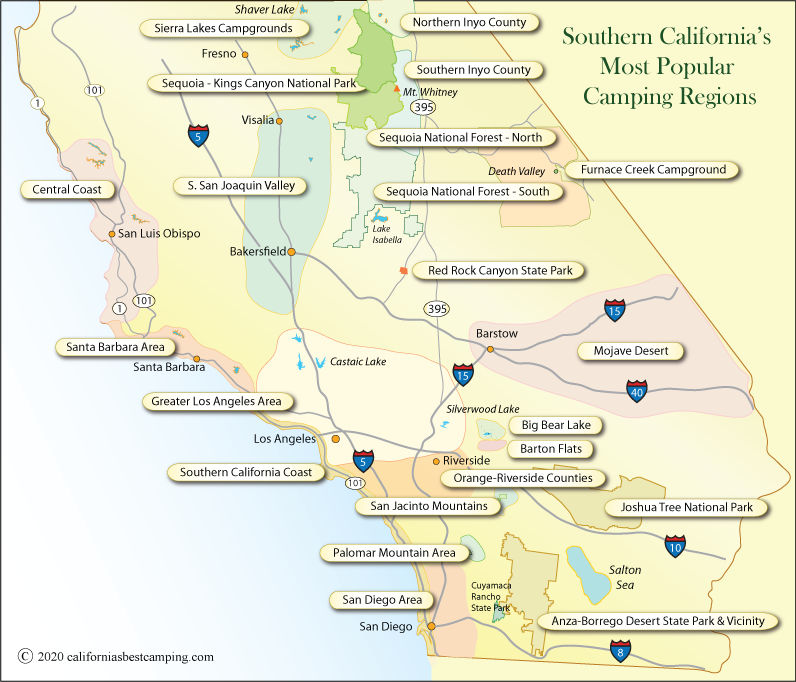 California's Best Camping website makes no warranties regarding the accuracy, completeness, reliability or suitability of this map. Every effort is made to provide accurate and up to date information, but we cannot be responsible for errors or for changes that may have occurred since publication. Always confirm information with the service provider and check for any recent changes that may have been made. The information provided on this website is done so without warranty of any kind, either expressed or implied, including but not limited to, the implied warranties of merchantability and fitness for a particular purpose.